First and foremost, we want you to understand where you’re going this summer. 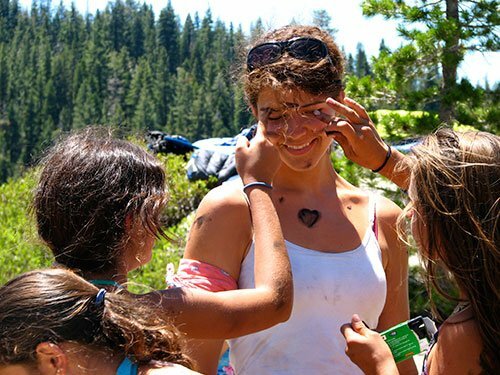 Deer Crossing Camp differs from most overnight summer camps in the U.S. due to its true wilderness location. We are located in a beautiful national forest, with an alpine lake at the front door and 100 miles of national wilderness behind us. When you leave the small town nearest camp, it is a 90-minute drive to Loon Lake, followed by either a 2.5 mile (4 km) hike or boat ride to camp. There is no road access to camp. Staff and their gear—as well as food, propane and gas, supplies, repair specialists—are boated down lake to Deer Crossing. Camp provides its own water and electricity. There is no cell phone access or landlines at camp; we use satellite phones for emergencies and to conduct camp business. Internet access is limited. Running a camp in the wilderness is hard work for everyone on staff. Yet the trade-offs are innumerable. Instead of commute traffic, deer traipse through the campground in search of tender greens. Instead of police sirens, birds sing in the morning, wind rustles through the trees in the afternoon, and coyotes call at night. Instead of skyscrapers, the night sky covers us, rich with stars. Immunizations (PDF)—The only required vaccination is a tetanus shot, received within the past 10 years. Make sure yours is up-to-date! Physician Exam (PDF)—To be completed by your physician, based on a physical conducted within 12 months of arrival at camp. Evidence of Medical Insurance—Email a copy or photo of your insurance card to the camp office. When you arrive at camp, you will need to show proof of eligibility to work in the U.S. We must see original documents, not copies. Check the Homeland Security website to make sure you have the documents you need. International Staff: your passport, U.S. visa, and DS 2019 will suffice. If you have any questions, contact the camp office. Look for the Staff Clothing & Equipment List in your online camp account, under Forms and Documents. Many staff have contributed to make this list as helpful as possible, so use it! For ease of carrying in our wilderness location, use a backpack (as in, for backpacking not school books) and/or duffel bags for your gear. No footlockers, suitcases, or roller bags. All Instructors must bring hiking boots with good ankle support. Bring battery-operated equipment, such as an alarm clock, and real books (on paper, not electronic). Electricity is limited at camp and you will not be able to charge electronic equipment as frequently as you do at home. Former staff recommend that you bring your own solar charger. Any electronic devices—such as cellphones, iPods, tablets, laptops—may only be used when you are off duty and out-of-sight of campers. Camp provides a laptop for use by staff who do not bring their own. 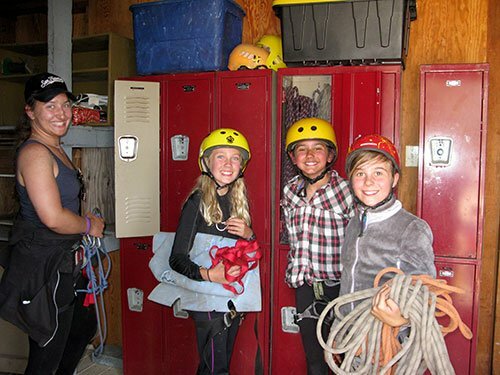 If you want to bring personal sports or other outdoor equipment (e.g., climbing gear, windsurfer) to camp, check with the camp office before leaving for camp. International Staff: Camp can provide bedding, including fitted sheet, pillow, blanket, and if desired, sleeping bag (although you may prefer your own). Not Allowed: Food of any kind, tobacco in any form, smoking/vaping supplies or paraphernalia, alcohol, recreational drugs (legal or illegal), weapons (pocket knives and multi-tools are okay), hair dryers, incense, fireworks, matches, gum, pets. Leave valuable jewelry, expensive cameras, etc. at home. The first and last days of work are mostly travel days to get you to and from camp’s wilderness location. So plan to arrive at San Francisco International Airport (SFO) the day before you start work and depart the day after your last day of work. Most airlines charge hefty change fees if there’s a problem, so before finalizing your travel arrangements, confirm your expected arrival and departure days and times with the camp office. Camp will arrange a shuttle from SFO to the camp director’s home, where you will spend the night prior to going to camp (a 5–6 hour drive). Watch for the email with shuttle confirmation and arrival instructions 1–2 weeks before your departure. You may caravan to camp with the staff van or find your own way to Loon Lake. In either case, check with the camp office regarding the meet up date, time, and location. There is parking at the lake for your vehicle.